This high performance SD card is UHS-1 enabled with transfer speed up to 60MB/s. This card is water-proof, temperature proof, x-ray proof and shock proof. SanDisk USA warranty. Compatibility with all SDHC enabled device per SD standard. This high performance SD card is UHS-1 enabled with transfer speed up to 90MB/s. This card is water-proof, temperature proof, x-ray proof and shock proof. SanDisk USA warranty. Easily remove from your camcorder and insert into computer or TV for viewing. In case your device does not support the UHS-I bus, this card also supports the Class 10 standard, which also features minimum write speeds of 10 MB/s. Included is an SD adapter, allowing this card to be used in card readers or devices that have an SD slot. 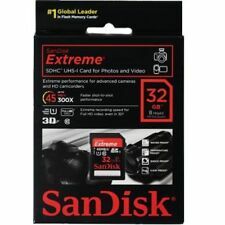 32 GB SD Memory Card used to store high quality digital still shots and video camera recordings. Can be used in our hidden cameras with built in DVR that require a standard SD Card. This high performance SD card is UHS-1 enabled with transfer speed up to 60MB/s. This card is water-proof, temperature proof, x-ray proof and shock proof. 4K Ultra HD capable. SanDisk USA warranty. 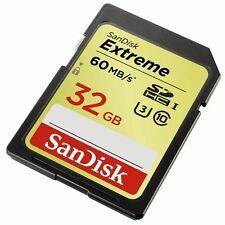 ALSO WORKS WELL FOR MANY OTHER DEVICES THAT CAN HANDLE 32GB SD CARDS! SanDisk products are constructed to the highest standards and rigorously tested. You can be confident in the outstanding quality, performance and reliability of every SanDisk product. SanDisk Ultra microSDXC and microSDHC cards are fast for better pictures, app performance, and Full HD video. Lot Of 8 PNY U3 Turbo Performance 32GB High Speed MicroSDHC Class 10 UHS-I. Condition is New. Picture shows 9, however I gave one to a friend so there are 8 remaining. 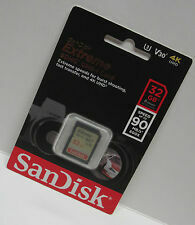 SanDisk 32 GB SDHC Card. Actual Photo. Search "RageCams GoPro Lens" on YouTube for our videos. OMNI CLAMP PAN TILT ADJUSTABLE HEAD GRIPPER 1/4" THREAD. Polarized Filter disk insert anti glare prevention/sun beam protection. HI-QUALITY SKULL HEAD STRAP. You do not need any drivers, software or cables. Keenai allows the automatic transfer of photo data from FlashAir cards and enables users to autosync photo and movie data to the cloud 6. Easy Wireless LAN Setup. TOSHIBA FLASH AIR W04 32GB SDHC CARD. Unirex MSU-325 Micro SD Card. SD Adapter. Compliant with SD Card Association Specifications. Adapter included. Key Features. Item Model Number: MSU-325. Technical Specs. 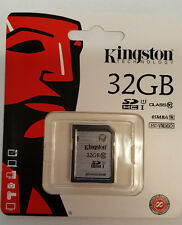 1 x 32GB Class 10 Mustang SD Card. This deal includes. • Records 4K UHD and Full HD video. 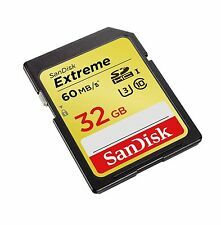 Write speeds of up to 90MB/s allow you to capture fast-action photos or shoot in continuous burst mode. 4K UHD READY. Compatible device required. 4K Ultra HD (3840x2160) and Full HD (1920x1080) video support may vary based upon host device, file attributes, and other factors. In addition to recording and capturing images, the maximum data read speed of up to 260 MB/s and write speed of up to 100 MB/s make it easy to streamline workflows. - UHS Speed Class 3 (U3). - 32GB Storage Capacity. Storage Capacity: 32 GB. MPN: PD-50PVTR. Designed for your sports camcorder, tablet, or smartphone, Lexar High-Performance 1000x microSDHC/microSDXC UHS-I cards. up to 150MB/s (1000x). Format: Micro SDHC. Accessories : UHSII 3.0 card reader. UHS SPEED CLASS: U3. Enjoy the convenience of fastest read/write speeds with class 10, U3. RECORDING CAPACITY : 32 GB. Ideal for burst shooting. High-speed data transfer up to 260MB/s (Read), 100MB/s (Write).